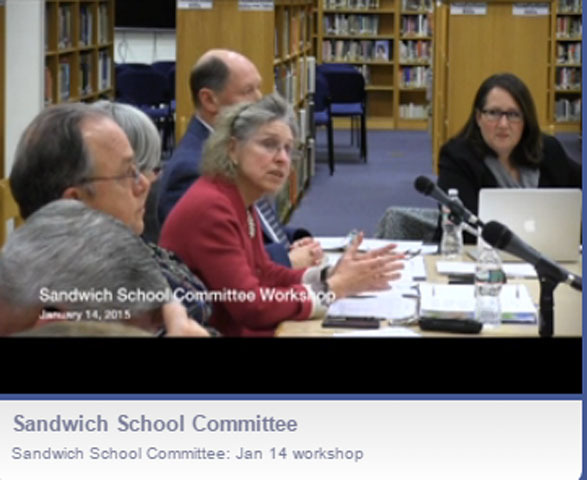 During the month of January, the School Committee is meeting every week. The first two weeks – January 7 and January 14, 2015 – are Budget Workshops. The purpose of the workshops is for the Superintendent and his Administrative Team to present their recommended budget to the School Committee. This year, the Finance Committee* has been invited to attend the Budget Workshops and to ask questions throughout the presentation to support their understanding of the budget. In Sandwich, we are very lucky to have Sandwich Community Television broadcast and archive the video of many of our public Boards and Committees. The meetings are long and complex, and a variety of important topics are discussed. We are including both a link to the video and a guide to the first Budget Workshop meeting. The guide is an outline of the topics discussed and indicates the specific place in the video when the discussion takes place. Click here for the SCT Video of the January 14, 2015 Budget Workshop. The Budget Workshops are not broadcast live because they are being held in the SHS Library; instead they are taped for rebroadcast. 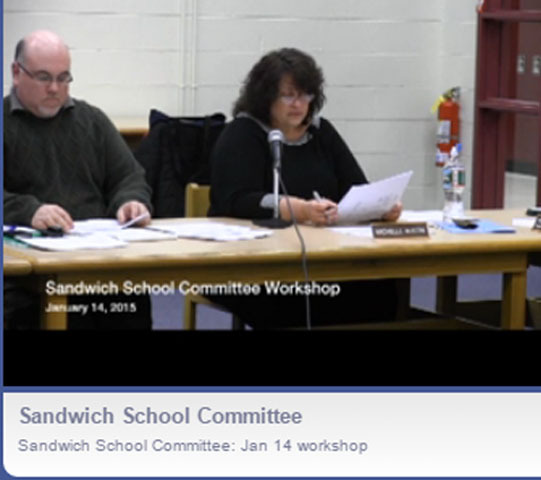 The January 7, 2015 meeting, with a guide to different parts of the meeting was previously published on Sandwich Learns Together here. Announcement that additional cuts were made following last meeting. The revised budget now matched the amount requested by the School Committee. @10:18 – Response to Mr. Parini’s Questions regarding the number of FTE’s in the SPS. @20:14 – Dr. Canfield explained his philosophy regarding Site-Based Budgeting. The goal is to reinforce the connection between the Building Administrator’s responsibility for programs and the budget. Note: January 21st will be a School Committee Business Meeting and will include the “Budget Hearing,” which is an opportunity for the public to comment on the budget. The School Committee will consider the Budget Workshop conversations and the Public Hearing and will vote in the Budget on January 28, 2015. At that time, the budget is no longer the “Superintendent’s Budget,” but is now the “School Committee’s Budget” to submit to the Board of Selectmen.